A clump of Allium tricoccum (with bloodroot blooming behind). 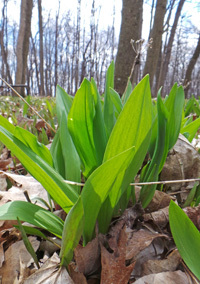 Of the many native wildflowers that grace the woods in spring, ramps is one of few that is considered a vegetable. Allium tricoccum – commonly known as ramps, but also is sometimes called wild leek, spring onion, or ramson – is frequently collected and sold at farmers markets or served in upscale restaurants in the spring as a delicacy for its strong garlic-like odor and sweet spring onion flavor. This is not surprising as it is a member of the onion family (Alliaceae). 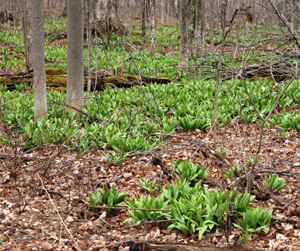 Large patches of Allium tricoccum in a maple woods in early spring. This spring ephemeral species is native to rich, moist, deciduous forests and bottoms of eastern North America, from Quebec to South Carolina and west to Minnesota (zones 3-8). The main habitat for ramps is forests dominated by birch, sugar maple, and poplar, but they are also found naturally under beech, linden (basswood), hickory, and oak. They are typically found in association with other wildflowers including bellwort, bloodroot, ginseng, mayapple, trout lily and trillium. Apparently indigenous peoples referred to the area around the southern part of Lake Michigan by the name they used for the dense colonies of this plant that grew there in the 17th century as CicagaWuni or shikako, which Europeans pronounced as “Chicago”. Allium tricoccum is a perennial herbaceous plant that grows from a bulb. Allium tricoccum is a perennial herbaceous plant that grows from a bulb. These conic bulbs are covered with a fibrous mesh and have thick, fleshy white roots from the base of the bulb. They are strongly rooted just beneath the surface of the soil. They grow in groups, as the bulbs continue to offset to enlarge the colonies. They are easy to distinguish from other similar-looking woodland plants by the distinctive onion scent that emanates if a leaf is torn or bulb cut. Leaves coming up in spring. 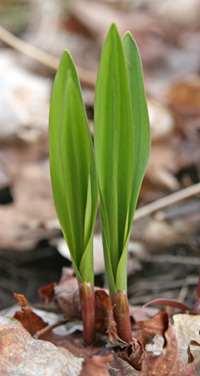 In the spring each bulb sends up two or three smooth, light green basal leaves that may be tinged with purple on the lower portion of the stem from the scallion-like stalk. The broadly lance-shaped leaves with smooth edges – reminiscent of tulip leaves – are tightly furled at first, but then expand and open to a wide (up to 3½ across), flat blade that narrows toward the base. The foliage dies back in summer, about the time the plants begin to flower. The foliage grows up to 8 inches high before dying back in early summer as the tree canopy leafs out to shade the ground. A skinny, smooth, leafless flower stalk, often reddish to maroon especially at the base, with a papery sheath at its base, appears at the time or just after the leaves have died back, with the flowers blooming in early summer. The terminal spherical inflorescences (umbels) can be up to an inch and a half across, with 25-50 ¼ inch long creamy to or greenish white flowers and 2 papery bracts at the base of the cluster. Each tiny flower has 3 sepals and 3 slightly longer petals surrounding the 6 stamens with pale yellow anthers and a single white style. Many types of native bees and syrphid flies will visit the flowers to obtain nectar and/or pollen. The small flowers are often overlooked when other more conspicuous woodland flowers are present. The flower stalks are covered with a papery sheath (L), that breaks open to reveal numerous white buds (LC and RC) that open into small white flowers in the terminal cluster (R). 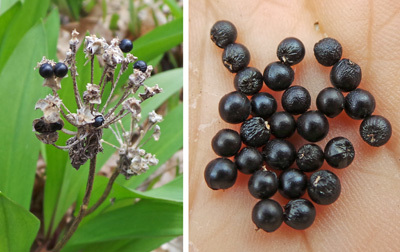 The shiny, sperical black seeds (R) persist through the winter on the old flower stalks (L). After pollination, in late summer a single small, hard, shiny black seed develops in each of the locules of the 3-celled seed capsules on the leafless stalk where they may persist through the winter. The seeds eventually fall to the ground near the original plant, so that dense colonies often form. A warm, moist period is required to break root dormancy and a subsequent cold period to break shoot dormancy, so the seeds may have to go through two winters before seedlings appear in the spring if the initial fall season not is long and moist enough. Ramps for sale at a farmers market. 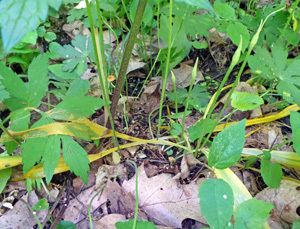 Both the leaves and lower white leaf stalks are edible. They are very pungent so can be used sparingly. They were traditionally consumed as the season’s first “greens” and are popular in a number of regional cuisines. The flavor is described as a combination of onions and strong garlic, which combines well with many other foods. They are commonly fried with potatoes, or added to scrambled eggs, or added to soups. 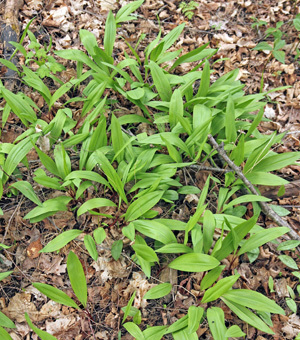 This plant is celebrated at many annual spring ramps festivals throughout the mountains of the eastern U.S. and other areas (but especially in Appalachia where ramps are widespread and common), with tremendous numbers of wild plants gathered from nearby forests. The intensive harvesting for these types of events and their increasing use in restaurants is seriously damaging the wild populations of ramps in some areas as they are being harvested in unsustainable quantities. Ramps grow best in shady areas. 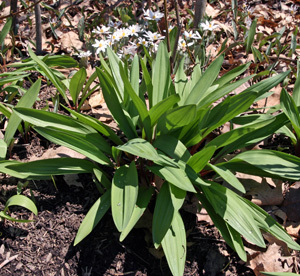 Ramps grow best in shady areas with damp soil throughout the year (not just the growing season) and highly organic soil with plenty of decomposed leaf litter. They tolerate full to partial shade and medium wet to medium dry soil. 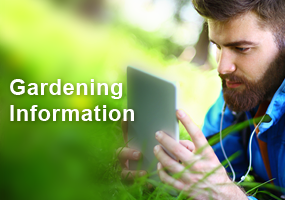 To cultivate these plants, grow from seed, bulbs, or young plants. Since seed germination can take up to 18 months and plants may not get large enough to harvest for 7 years, the latter is often preferred. 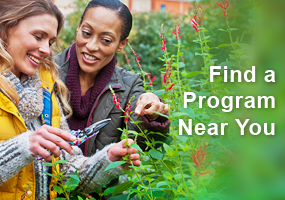 Bulbs can be purchased or transplanted in early spring to obtain harvestable plants in 2 to 3 years (from large – greater than ½ inch in diameter – bulbs). Transplantation can also be done in the fall as long as the soil is kept moist until the ground freezes. Bulbs should be placed about 3 inches deep in the soil, and transplants placed at the original depth. 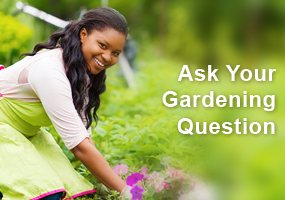 Seeds, bulbs, or plants should be mulched with 2 to 3 inches of composted hardwood leaves or natural leaf litter. Plant ramps along with other native species, such as wild ginger (Asarum canadense) or black cohosh (Actaea racemosa), that will grow later in the season to cover the area after the leaves die back. 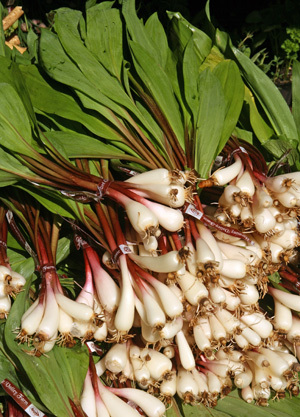 When harvesting ramps for either eating or transplanting, use care to not damage the bulbs. I grew up in the 50’s and 60’s in the Smokey Mountains. We could be sent home from school for three days for eating ramps. They have a strong odor, so be careful when eating them. I have a large forested area near my home and have harvested mushrooms in there for years. This year a friend came with me and she found ramps. I had no knowledge of these tasty treats, but now I do. I was happy to read this article to learn more about their habitat and proliferation.